Made available in DSpace on 2015-07-24T13:22:31Z (GMT). 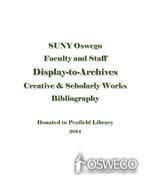 Display to Archives Creative & Scholarly Works Bibliography Page 2 of 15 Penfield Library, SUNY Oswego 2014 Altschuler, Bruce E. Political Science, Emeritus Altschuler, Bruce. Rev. of The President as Commander in Chief: An Essay in Constitutional Vision Law and Politics Book Review 24 (2014): 210 13. Law and Politics Book Review Web. 4 June 2014. . Altschuler, Bruc e E., and Michael A. Genovese, eds. Shakespeare and Politics: What a Sixteenth Century Playw right Can Tell Us about Twenty F irst Century Politics Boulder: Paradigm, 2014. Print. Andrews, David Economics Andrews, David. "Adam Smith's Natural Prices, the Gravitation Metaphor, and the Purpose of Nature." Economic Thought 3.1 (2014): 42 55. Print. Bacher, Leigh F. Psychology Bacher, Leigh F. "Development and Manipulation of Spontaneous Eye Bli nking in the First Year: Relationships to Context and Positive Affect." Developmental Psychobiology 56.4 (2014): 783 96. Print. Bendinskas, Kestutis Chemistry Gump, Brooks B., et al. "Low L evel Mercury in Children: Associations with Sleep Duration and Cytokines TNF 6 ." Environmental Research 134 (2014): 228 32. Print Braun, Timothy F. Chemistry Braun, Timothy F., and Lisa M. Glidden. Understanding Energy and Energy Policy London: Zed Books, 2014. Print. Display to Archives Creative & Scholarly Works Bibliography Page 3 of 15 Penfield Library, SUNY Oswego 2014 Brunson, John Biological Sciences, Emeritus Consort Gems of the Late Renaissance The Oswego Recorder Consort. Prod. Dan Wood. Rec. 3 Sept. 2011. CD. The Oswego Recorder Consort is comprised of: John Brunson, Marilynn Smiley, Jane Wright, Burton Phillips. Crider, David Communication Studies Crider, David. "For Those (Men) About to Rock: Rock Radio and the Crisis of Masculinity." Journal of Radio & Audio Media 21.2 (2014): 258 71. Print. Damkaci, Fehmi Chemistry Gulacar, Ozcan, Fehmi Damkaci, and Charles R. Bowman. "A Comparative Study of an Online and a Face to Face Chemistry Course." Journal of Interactive Online Learning 12.1 (2013): 27 40. Print. Damkaci, Fehmi, Michelle Dallas, and Megan Wagner. "A Microwave Assisted Friedel Crafts Acylation of Toluene with Anhydrides." Journal of Chemical Education 90.3 (2013): 390 92. Print. Damkaci, Fehmi, and Addam Szymaniak. "Multicomponent Heterocyclic Chemistry for Undergraduate Organic Laboratory: Biginelli Reaction with Multiple Unknowns." Journal of Chemical Education (2014): n. pag. DO I: 10.1021/ed400390k Damkaci, Fehmi, et al. "N picolinamides as Ligands for Ullmann type Homocoupling." Tetrahedron Letters 55 (2014): 690 93. Print. Delaney, Tim Sociology Delaney, Tim, and Tim Madigan. Beyond Sustainability: A Thriving Environment Jefferson: McFarland & Company, 2014. Print. Display to Archives Creative & Scholarly Works Bibliography Page 5 of 15 Penfield Library, SUNY Oswego 2014 Gilliard Cook, Theresa Extended Learning Gilliard Cook, Theresa, and Brandon West. "Authentic Learning: Creating Meaning in the Higher Ed Classroom." The EvoLLLution Dec. 2014: n. pag. Digital file. Glidden, Lisa Political Science Wylie, Lana, and Lisa Glidden. "'The 'Cuban Spring' Fallacy: The Current Incarnation of a Persistent Narrative." International Journal of Cuban Studies 5.2 (2013): 140 67. Print. Braun, Timothy F., and Lisa M. Glidden. Understanding Energy and Energy Pol icy London: Zed Books, 2014. Print. Hellquist, C. Eric Biological Sciences Hellquist, C. Eric. Rev. of Botanical Heritage of Islands at the Brink of Niagara Falls Journal of the Torrey Botanical Society 140.4 (2013): 523 24. Print. Hellquist C. Eric, C. Barre Hellquist, and Jennifer J. Whipple. New Records for Rare and Under C ollected Aquatic Vascular Plants of Yellowstone National Park." Madrono 61.2 (2014): 159 76. Print. Hertz Ohmes, Peter Modern Languages & Literatures, Emeritus Hertz Ohmes, Peter. "Deleuzian Empiricism and the Potential of Chaotic Choreographies." Wissen wir was ein Krper vermag? : Rhizomatische Krper in Religion, Kunst, Philosophie Ed. Arno Bohler Krassimira Kruschkova, and Susan ne Valerie. Bielefeld: Verlag, 2014. 137 48. Print. Jung, Taejin Communication Studies Jung, Taejin, and Donnalyn Pompper "Assessing Instrumentality of Mission Statements and Social Financial Performance Links: Corporate Social Responsibility as Context." International Journal of Strategic Communication 8 (2014): 79 99. Print. Display to Archives Creative & Scholarly Works Bibliography Page 6 of 15 Penfield Library, SUNY Oswego 2014 Pompper, Donnalyn, and Taejin Jung. "'Outnum bered yet Still on Top, but for How Long?' Theorizing about Men Working in the Feminized Field of Public Relations." Public Relations Review 39 (2013): 497 506. Print. Kane, John Economics Kane, John, Lawrence Spizman, and Don Donelson "Educational Attainment Model for a Minor Child: The Next Generation." Journal of Forensic Economics 24.2 (2013): 175 90. Print. Kumar, Alok Physics Kumar, Alok. Sciences of the Ancient Hindus: Unlocking Nature in the Pursuit of Salvation N.p. : CreateSpace, 2014. Print. MacK enzie, James Biological Sciences Gump, Brooks B., et al. "Low level Mercury in Children: Associations with Sleep Duration and Cytokines TNF 6." Environmental Research 134 (2014): 228 32. Print. Markert Linda Rae Educational Administration Markert, Linda Rae. "That Was Then! Changing Landscapes for School Building Leaders." Vanguard 43.3 (2014): 35 38. Print. Markowsky, Vincent Counseling Services Center Markowsky, Vince nt Setting My Words Free: Inspirational Messages for Adults Who Stutter N.p. : CreateSpace, 2014. Print. Display to Archives Creative & Scholarly Works Bibliography Page 7 of 15 Penfield Library, SUNY Oswego 2014 McKeown, Joshua International Education & Programs McKeown, Joshua. Strategic Planning for Education Abroad Programs. NAFSA's Guide to Education Abroad for Advisers and Administrators Ed. Magnolia Hernandez, Margaret Wiedenhoeft, and David Wick. 4th ed. Washington D.C.: NAFSA: Association of International Educators, 2014. 213 26. Print. M unger, Kristen A. Counseling & Psycholog ical Services Murray, Maria S., Kristen A. Munger, and Elfrieda H. Hiebert. "An Analysis of Two Reading Intervention Programs." Elementary School Teacher 114.4 (2014): 479 500. Print. Blachman, Benita A., et al. "Intensive Reading Remediation in Grade 2 or 3: Are Th e re Effects a Decade Later?" Journal of Educational Psychology 106.1 (2014): 46 57. Print. Munger, Kristen A., and Maria S. Murray. Text Complexity and Deliberate Practice: Common Cores of Learning. Best Practices in Adolescent Litera cy Instruction Ed. Kathleen A. Hinchman and Heather K. Sheridan Thomas. 2nd ed. New York: Guilford, 2014. 99 119. Print. Murray, Maria S. Curriculum & Instruction Murray, Maria S., Kristen A. Munger, and Elfrieda H. Hiebert "An Analysis of Two Reading Intervention Programs." Elementary School Teacher 114.4 (2014): 479 500. Print. Blachman, Benita A., et al. "Intensive Reading Remediation in Grade 2 or 3: Are Th e re Effects a Decade Later?" Journal of Educational Psychology 106.1 (2014): 46 57. Print. Munger, Kristen A., and Maria S. Murray. Text Complexity and Deliberate Practice: Common Cores of Learning. Best Practices in Adolescent Literacy Instruction Ed. Kathleen A. Hinchman and Heather K. Sheridan Thomas. 2nd ed New York: Guilford, 2014. 99 119. Print. Display to Archives Creative & Scholarly Works Bibliography Page 8 of 15 Penfield Library, SUNY Oswego 2014 Nanthakumar, Ampalavanar Mathematics Nanthakumar, A., S. Ganesalingam, and Siva Ganesh. "On Cupola Based Discriminant Rule." Journal of Statistics & Management Systems 13.6 (2013): 401 17. Print. Ochoa, Marilyn Library Kumar, Swapna, Kristin Heathcock, and Marilyn Ochoa. Sustainable Embedded Librarians hip to Foster Research Skills i n an Online Graduate Program. Virtually Embedded: The Librarian in an Online Environment Ed. Elizabeth Leo nard and Erin McCaffrey. Chicago: Association of College and Research Libraries, 2014. 39 51. Print. Ochoa, Marilyn N Laurie N. Taylor, and Mark V. Sullivan. Digital Collections Assessment and Outreach Washington, D.C.: Association of Research Libraries, Office of Leadership and Management Services 2014. Print Perticone, Eugene X. Coun seling & Psychological Services, Emeritus Perticone, Eugene X. Waldo Emerson, My Grandfather, and Me: A Novel Bloomington: IUniverse, 2014. Print. Rivera Vazquez, Omara Public Justice Rivera Vazquez, Omara. Moral Development. The Encyclopedia of Criminology and Criminal Justice Ed. Jay S. Albanese. Vol. 4. N.p. : Wiley Blackwell, 2014. 1486 89. Print. The Wiley Series of Encyclopedias in Crimin ology and Criminal Justice. Rivera Vazquez, Omara. Police Stress. The Encyclopedia of Criminology and Criminal Justice Ed. Jay S. Albanese. Vol. 4. N.p. : Wiley Blackwell, 2014. 1675 79. Print. The Wiley Series of Encyclopedias in Criminology and Crimina l Justice. Rodgers, Mary Tone Accounting, Finance & Law Rodgers, Mary Tone, and James E. Payne. "How the Bank of France Change d U.S. Equity Expectations and Ended the Panic." Journal of Economic History 74.2 (2014): 420 48. Print. Display to Archives Creative & Scholarly Works Bibliography Page 9 of 15 Penfield Library, SUNY Oswego 2014 Schofield, Damian Computer Science Tanner, Patricia, Carly Karas, and Damian Schofield. "Augmenting a Child's Reality: Using Educational Tablet Technology." Journal of Information Technology Education: Innovations in Practice 13 (2014): 45 54. Print. Schofield, Damian. "A Virtual Education: Guidelines for Using Games Technology." Journal of Information Technology Education: Innovations in Practice 13 (2014): 25 43. Print. Sime, Karen R. Biological Sciences Sime Karen R., and Kent M. Daane. "A Comparison of Two Parasitoids (Hymenoptera: Encyrtidae) of the Vine Mealybug: Rapid, Non discriminatory Oviposition Is Favored When Ants Tend the Host." Environmental Entomology 43.4 (2014): 995 1002. Print. Buckner, Jan et, Amy B. Welsh, and Karen R. Sime. "Evidence for Population Differentiation in the Bog Buckmoth of New York State." Northeastern Naturalist 21.4 (2014): 506 14. Print. Smiley, Marilynn Music, Emerita Smiley, Marilynn J. James Carroll." The Grove Dictionary of American Music. 2nd ed. Vol. 1. New York: Oxford University, 2013. 365. Print. Consort Gems of the Late Renaissance The Oswego Recorder Consort. Prod. Dan Wood. Rec. 3 Sept. 2011. CD. The Oswego Recorder Consort is comprised of: John Brunson, Marilynn Smiley, Jane Wright, Burton Phillips. Smiley, Marilynn J. The Grove Dictionary of American Music. 2nd ed. Vol. 5. New York: Oxford University, 2013. Print. Smiley, Marilynn J. e." The Grove Dictionary of American Music. 2nd ed. Vol. 5. New York: Oxford University, 2013. 684 685. Print. Display to Archives Creative & Scholarly Works Bibliography Page 10 of 15 Penfield Library, SUNY Oswego 2014 Spizman, Lawrence Economics Emeritus Kane, John, Lawrence Spizman, and Don Donelson "Educational Attainment Model for a Minor Child: The Next Generation." Journal of Forensic Economics 24.2 (2013): 175 90. Print. Steiger, Scott Atmospheric and Geological Sciences SUNY Oswego Storm Forecasting and Observation Program 2012 Dir. Scott Steiger. Prod. Brett Rathbun. 2012. SUNY Oswego, 2012. DVD. SUNY Oswego Storm Forecasting and Observation Program 2014 Dir. Scott Steiger. Prod. Brett Rathbun. 2014. SUNY Oswego, 2014. DVD Tomascak, Paul Atmospheric and Geological Sciences Yu, Jimin, et al. "Controls on Sr/Ca in Benthic Foraminifera and Implications for Seawater Sr/Ca during the Late Pleistocene." Quaternary Science Reviews 98 (2014): 1 6. Print. Turco, Lewis English, Emeritus Turco, Lewis. The Familiar Stranger Scottsdale: Star Cloud, 2014. Print. Wellman, Judith History Emerita Wellman, Judith. Brooklyn's Promised Land: The Free Black Community of Weeksville, New York New York: New York University Press, 2014. Print. W est, Brandon Library Gilliard Cook, Theresa, and Brandon West. "Authentic Learning: Creating Meaning in the Higher Ed Classroom." The EvoLLLution Dec. 2014: n. pag. Digital file. Display to Archives Creative & Scholarly Works Bibliography Page 11 of 15 Penfield Library, SUNY Oswego 2014 Wilcox, Elizabeth Mathematics Wilcox, Elizabeth. "Can a Pure Mathematician Really Dig Statistics?" Ma th Horizons Nov. 2013: 28 29. Print. Wilcox, Elizabeth, et al. "Group Theory Session." Ohio State Denison Mathematics Conference. Columbus Ohio. 9 May 2014. Organizer. Brewster, Ben, Peter Hauck and Elizabeth Wilcox. "Quasi A ntichain Chermak Delgado Lattices of Finite Groups." Archiv der Mathematik 103.4 (2014): 301 11. Print. Wood, Dan Music Consort Gems of the Late Renaissance The Oswego Recorder Consort. Prod. Dan Wood. Rec. 3 Sept. 2011. CD. The Oswego Recorder Consort is compri sed of: John Brunson, Marilynn Smiley, Jane Wright, Burton Phillips Wright, Jane Library, Emerita Consort Gems of the Late Renaissance The Oswego Recorder Consort. Prod. Dan Wood. Rec. 3 Sept. 2011. CD. The Oswego Recorder Consort is comprised of: John Brunson, Marilynn Smiley, Jane Wright, Burton Phillips Zenor, Jason Communication Studies Zenor, Jason. "Where Are Those Good Ol Fashioned Values? Reception Analysis of the Offensive Humor on 'Family Guy.'" Operant Subjectivity: The International Journal of Q Methodology 37.1 2 ( 2014): 23 40. Print.